Flying high with Tom Cruise in this VR “weightless” experience. Taking a walk inside the replica plane and past the infamous sarcophagus from The Mummy movie, I was expecting the film’s VR companion experience to be just another Hollywood movie BTS 360 video — but it was from that. 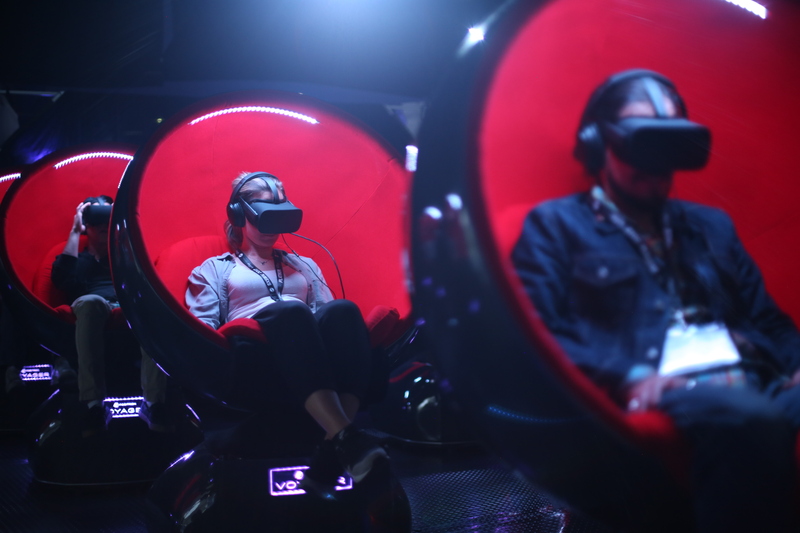 Set up in Ballroom B at the Austin Convention Center during SXSW, the immersive journey all began sitting in a eggshell like Positron Voyager chair, the first full motion chair designed for cinematic VR. Leaning back in the bright red seat with Oculus Rift headset and headphones on, the iconic intro title for Universal Pictures opened the experience. The classic logo sat atop the words “Virtual Reality,” which on a subconscious level resonated with me, creating a sense of nostalgia and excitement on a legitimate future for VR and Hollywood. Then Tom Cruise appeared, speaking directly to you and explaining what to expect from the experience. The upcoming The Mummy movie features a plane crash scene which was shot in a zero gravity aircraft, aka the vomit comet. The VR experience then enlists Cruise to take us behind the scenes in VR to show the audience how this complex scene was shot, all while touring each part of the plane to understand exactly how this is going to go down. It’s well known that Tom Cruise does all of his own stunts and does a good job keeping you on the edge of your seat. In this particular experience though, you literally lift off your seat. It’s incredibly difficult to shoot anything in a Zero G plane. Your body weight goes through drastic changes during the whole process. When the plane prepares for a zero-gravity maneuver, it starts at a lower altitude and begins to ascend at a fast rate that causes your body feel twice as heavy. Once the aircraft reaches the desired altitude, the plane levels out for about 22–27 seconds which creates a zero-gravity environment as you descend. At this point, there is no gravitational pull in the plane and you experience weightlessness.When the plane begins to descend, the g-force increases again making everything feel heavy again. This parabolic maneuver is then repeated. This motion causes you to feel like your blood is rushing down your body and your guts being pulled down into the floor. One can only imagine the challenges to shooting a Hollywood cinematic feature this way. You can’t use camera stabilizers since there’s no gravity. You only have 22 to 27 seconds for each take during the low gravity window, all while ensuring a safe shoot while objects and actors fly around you. So how do you capture this floating with a 360-degree camera like the Nokia Ozo on a monopod without disorienting and nauseating the viewer? Chris Olimpo from VR production studio, 5th Wall, gave us the lowdown on the process to shoot the scene. As your body and surroundings go through the weight changes, the cinematographer has to have the strength to keep the heavy camera steady and also have the muscle memory to anticipate weight changes. Not to mention matching the camera speed and height to Cruise and Wallis as they perform the scene. Watching this experience in VR was unique. As the crew awkwardly floats around you trying to keep control of the camera, I noticed that this was far from a staged BTS, something you might see as an addition to a DVD release. Everyone in the scene was genuinely just having fun and being goofy as they swam around you. Although, by the time the 14th scene take comes around, the fun wears off and you realize how hard the crew is working to get the shot. But like I said, this VR experience wasn’t just your standard VR BTS video clip. If Tom Cruise is floating in a plane and experiencing zero gravity and you’re there with him, then you have to be weightless too. Thats where the Positron Voyager chair came into play. As the plane went through zero gravity, the chair tilted up and down, giving you the feeling of floating with feet dangling off the side. The chair eliminated motion sickness and included haptic audio from Subpac that made the entire experience that much more immersive. This experience was one of the more innovative ways of showing a behind the scenes for a movie, not just in VR but in general. It’s thrilling to see a studio like Universal Pictures push the limits of this new medium and can’t wait to see what other high-flying ideas they think of next.